NEW BRITAIN - Central Connecticut State University is putting on its dancing shoes for the fourth annual Connecticut High School Dance Festival on Saturday, Oct. 20. The event is set for 8 a.m. to 6 p.m. in Welte Auditorium. Students and teachers from schools and studios throughout the state will have the opportunity to receive professional feedback and attend dance classes and workshops. Classes and workshops on several dance styles and techniques will be offered throughout the day. Those classes will include, but will not be limited to, ballet, hip-hop, jazz funk and Afro-Caribbean. 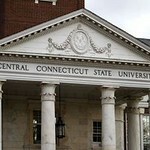 One of the attractions she emphasized is that participants will be able to perform on CCSU’s “beautiful” Welte stage. The registration fee for participating schools is $100 and then $50 per student. That $50, according to Fellows, can be paid by either the school or the student. “The price that they’re paying for the day would equal what they would pay for one class in a convention,” she stated. To register, visit www.ccsu.edu/dance , or contact Jennifer DelSanto at delsantoje@ccsu.edu or at 860 832-2155 for more information. Posted in The Bristol Press, Arts, General News on Tuesday, 9 October 2018 20:57. Updated: Tuesday, 9 October 2018 21:00.